2) Suffering proves God does not exist. If God was all loving and all powerful he would and could stop suffering. 3) Humans are just like other animals – a bunch of conglomerated atoms and molecules – there is no proof of any transcendent “soul” within us. 4) There is no proof at all that Jesus was anything special and certainly not divine. There is no real proof of his existence or resurrection – just myths. These lies have been ignored for far too long. We cannot continue to teach the fundamental tenets of our faith and deny the devastation within our Church. We must do something and quickly. 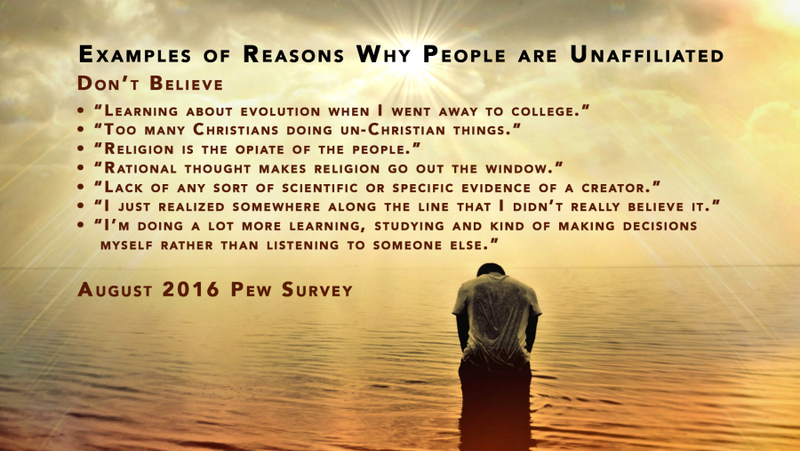 The following text is from the August 2016 Pew survey. Note the reasons millennials are leaving the Church. One is a quote by Karl Marx! 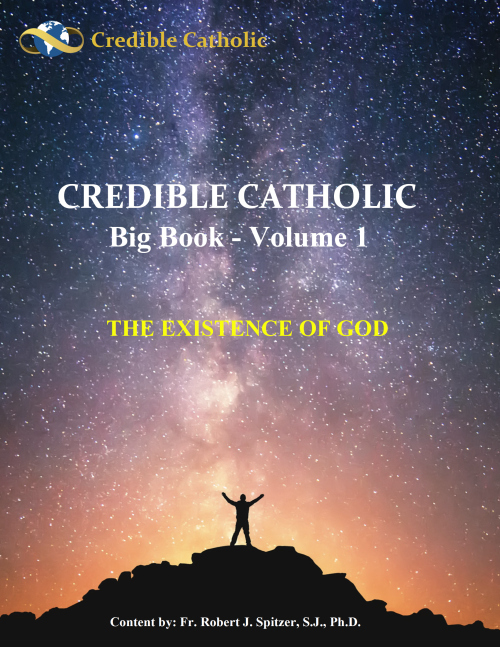 Everything on this list is addressed in the Credible Catholic Series – most directly, some indirectly. Who else is providing this necessary content? 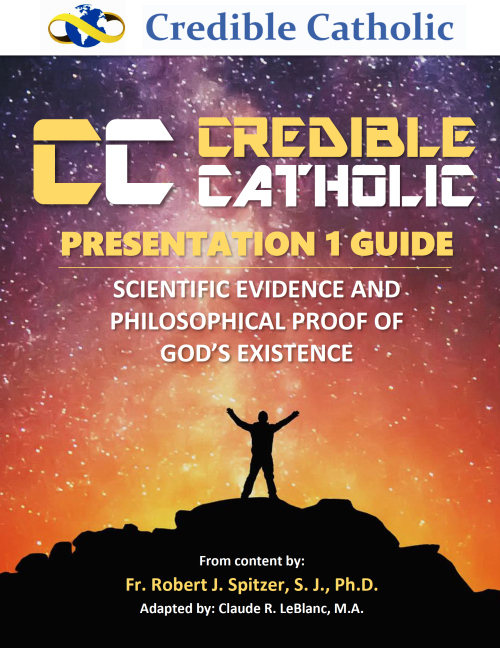 Credible Catholic (CC) is NOT just another provider of Catholic content. 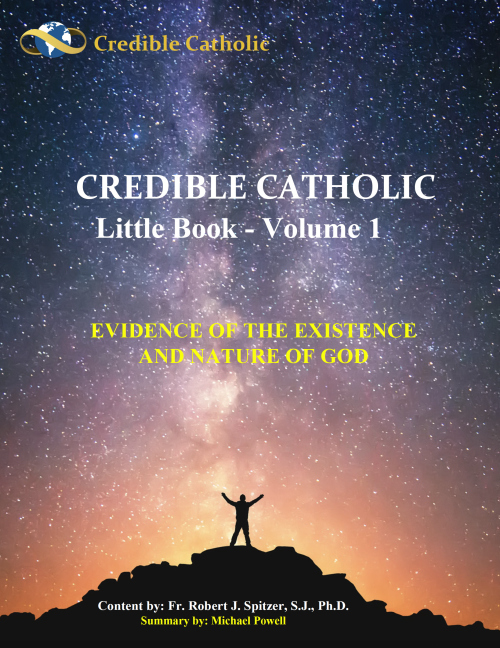 Credible Catholic is a force designed to stem the atrophy from within our Church and theism in general. Credible Catholic marks the return of apologetics in our education channels (as preferred by our Bishops). We seek to completely discredit the secular myths that are creating the “NONES” (see above under WHY). 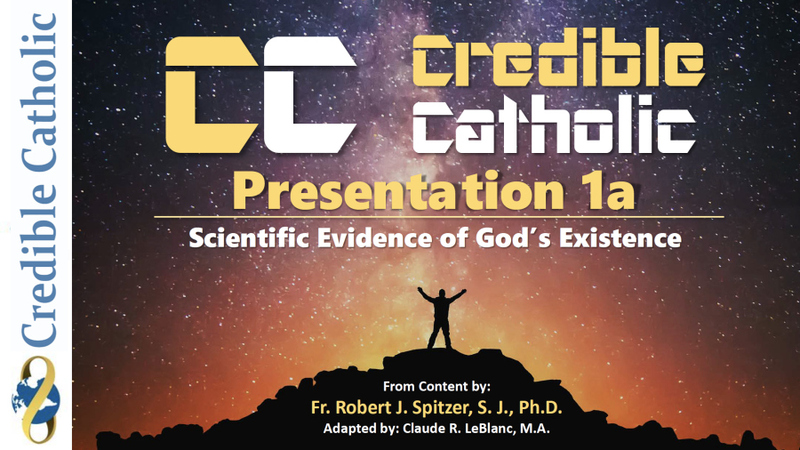 To this end, Credible Catholic offers FREE on-line teaching products based on content from Father Robert J. Spitzer, S.J., Ph.D. While the initial products are targeted at High School through adult studies, a series for middle school is also in development. I. CC Presentation: Downloaded slide presentations are PDF files with embedded videos, quotation voiceovers and an optional version with professionally read voiceovers for most of the slides (NOTE – in order to play the embedded videos and voice files on downloaded presentations, you will need Adobe Acrobat Reader and Adobe Flash Player. For Apple products you may need QuickTime Player.). You can play the presentation directly from our website with no special apps. required. You can VIEW (play) the presentation directly from our website with no special apps. required. With the recommended apps on your computer, you can choose to download the Presentation to your computer by clicking on the DOWNLOAD button. We recommend you save it to your computer and then play it from your hard drive. You can also save it to a USB drive to easily use on another computer or share with others. It can be streamed directly from our website by selecting the VIEW button. Since it will be playing through your Wi-Fi, there may be some interruptions if the Wi-Fi speed is not sufficient to keep up with the video caching. At the end of each Presentation (in the VIEW mode), you will find additional resources you can access. A chart is included, developed by the program designer, that provides a guide to present classes from one to two hours in length. Since these are slide presentations, they can be broken into even smaller segments if desired. This is strictly a guideline as these lessons are easily customized. The Guides include activities, quizzes and quiz keys for the presenter and Student Surveys to get the student’s opinions (only the activities appear in the “DOWNLOAD” version – teachers can print and distribute quizzes etc. at their discretion). Using our provided surveys, several Catholic High Schools have reported that over 95% of their students state these modules have improved their faith. We will share this data on request. CC Programs: In addition to developing the 20 Modules mentioned above, CC is also creating programs for specific classes, e.g., Confirmation, Marriage (Pre-Cana), RCIA, Baptism etc. DREs, catechists, religion teachers and home schoolers can all select the precise content they desire – individual modules or a pre-set program. 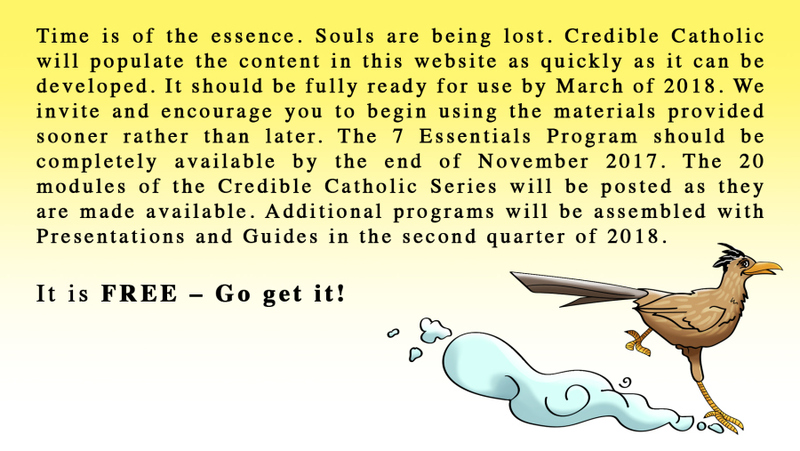 By pulling one or more of the 20 Credible Catholic Modules, custom Programs can be easily created. Father Spitzer’s highest priority among the programs is his 7 Essential Modules. The Seven Essential Modules directly address the incorrect myths enumerated earlier. One might view this program as an inoculation against the “myth virus”. Father believes every High School student should be exposed to this content immediately. It has been tested and proven effective in Catholic high Schools. In our initial (California) High School survey, 97% reported it either improved or greatly improved their faith. A college student in Australia, after reviewing the first 5 Presentations, reported they had a “Very Positive” impact on his faith. Beta testing is ongoing both here and abroad. crediblecatholic.com (cc.c): If you are reading this, you are probably on the cc.c website. All of the 7 Essential Modules are available on this site under the PROGRAMS tab. Other Modules and Programs will be available by early 2018 and will be accessible from the MODULES or PROGRAMS tabs or by scrolling down to the corresponding images on the HOME page. The Guides, Little Books and Big Books will be available in print editions at a minimal cost. Schools and Parishes will find having a complete set of the print editions of the Little Books useful as well a complete set of the Guides. The Guides will also be printed with multiple Presentations for Programs with multiple Modules. For example, there will be a Guide for the 7 Essentials Program that will contain all seven Presentations. Father Spitzer’s recommendation is to show all of the “7 Essential Modules” immediately to all students and adults. It is Free – it is easy to present – Get it NOW!